What is it about cork flooring that has lead to its surge in popularity? Read on to learn the limitations and benefits of cork flooring. Cork is a by-product of the cork oak tree. Initially cork was used to preserve the quality of liquids such as wine in bottles and cork boards to paste notes. Nowadays it is used as a type of flooring and is gaining momentum thank to its eco-friendliness. Cork flooring is synonymous with “Green Flooring”. Cork is made from a renewable resource, which is the cork oak tree, that is stripped every nine years and the stripping does not damage the tree. It is primarily found in the Mediterranean region and Portugal is the largest producer of cork in the world, other countries being Spain, Algeria, Tunisia, Italy, Morocco and France. Cork has a sealed honeycomb cellular structure which gives it elasticity. The raw material for cork is stripped off the cork tree, wine corks are screwed out of it and then the post-industrial waste is boiled. Finally it is ground up, compressed to form cork sheets or tiles that can be used for flooring or walls. Traditionally cork flooring was used in libraries and churches as it absorbs sound. The appeal for green is taking the cork flooring to residences and offices too! Cork is made into tiles and planks which are used in resilient flooring because of its elasticity. Cork flooring can be done in two ways. The Adhesive Connection which involves cork tiles or The Floating Floor installation for residences. Cork is subject to expansion and contraction with the level of moisture in the room. Therefore, one must be wary of the humidity content of the room, where the cork flooring is being laid. However, this does not stop the material from being used on bathroom walls! The quality and the pattern that one opts for, influences the price of the cork flooring. 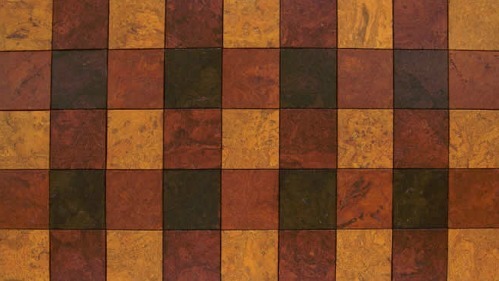 It can range from $4 to $6 per square foot which is quite low when compared to hardwood flooring. 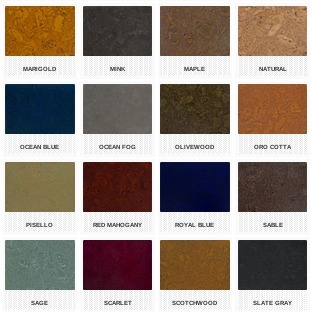 One can choose from a wide variety of styles, colors and shapes with this type of flooring. There are as many as 40 different colors and the shapes of the tiles come in squares, rectangles and even hexagons! It is a recycled material flooring which is sound-resistant, fire-resistant, and insect-resistant and an anti-allergen. It has a cushioning effect under your feet which makes it a good option for the flooring in kitchens where one needs to spend long hours standing. Cork is 50% air which provides spring to the floor and lasts as long as other wooden floorings. Mix rubber with cork to provide texture to the flooring or walls. Cork is comfortable and soft flooring that will take care of your feet even if you have to stand for long hours. It helps you maintain the beauty of your house as it disguises dust, which could be quite visible on other flooring types. It is noise control flooring as it absorbs sound. So, a heavy drop on the floor or loud footsteps will not make that much of a noise as that of a wooden floor. Its eco-friendliness makes it healthy and safe for all kinds of traffic at home such as children or pets. Cork has been termed as equally durable like the rest of its flooring counterparts. It has been known to last 100 years just like wooden floors! It is easy to maintain cork flooring as it can be cleaned by vacuuming, sweeping or dry mopping. Even if cork flooring has seemed an ideal choice to us, it still comes with a few drawbacks of its own. However, they can be easily overcome with additional care. Cork is prone to scratches and indentations. Hence, while placing heavy objects like tables on cork flooring, you can always use coasters under its legs to avoid imprints or damages to the floor. A coat of Polyurethane will help you protect your cork flooring from indentations. Exposure to sunlight may cause the cork flooring to fade, however this can be overcome with a coat of UV protected paint. Though its cost is lesser than wooden flooring, carpet and vinyl tiles are a much cheaper option. Despite its drawbacks, cork still holds a better position than other types of flooring as it is eco-friendly and can last forever! Jason Phillips is an interior designing consultant at cobaeurope.com. The site is for matting and flooring products. When he is not writing about cork flooring and other flooring options he is decorating his home in new ways and giving it a new look.